A professional Fundraiser with integrity when building and managing new and existing relationships. A passionate individual with a highly ethical and moral approach to working practices and experience of making a difference. Excellent at communicating a compelling business case with the ability to persuade and influence individuals to make the right decision. Responsible for building long term relationships with individuals, organisations, companies, and local authorities and taking responsibility for raising funds for the charity and coordinating all fundraising activities and events. 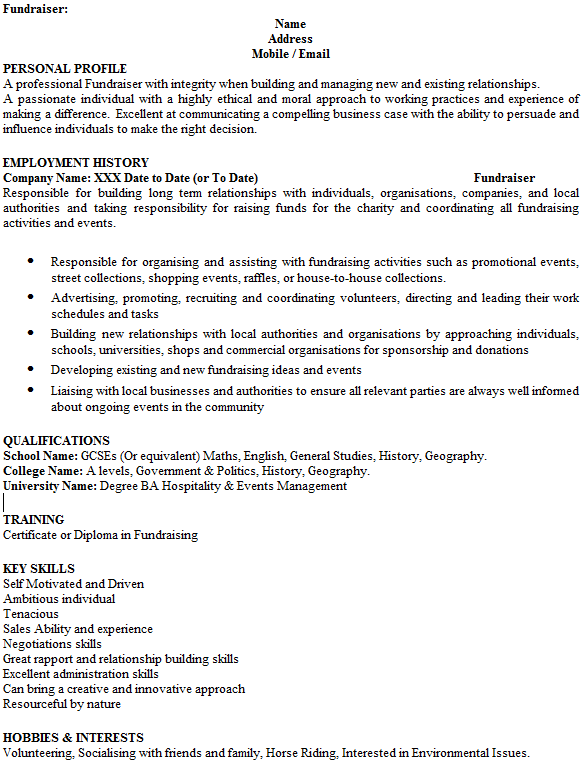 Responsible for organising and assisting with fundraising activities such as promotional events, street collections, shopping events, raffles, or house-to-house collections. School Name: GCSEs (Or equivalent) Maths, English, General Studies, History, Geography. College Name: A levels, Government & Politics, History, Geography. Volunteering, Socialising with friends and family, Horse Riding, Interested in Environmental Issues.